Only a couple weeks until Ubercon. Jed and I are going to be there. Anyone else coming? WOH-PAH! Off to Important threads with ye! Oooh! I am! I am! I'll be lurking somewhere about. Now, for the 8551 or so of you who didn't go... The Con rocked. 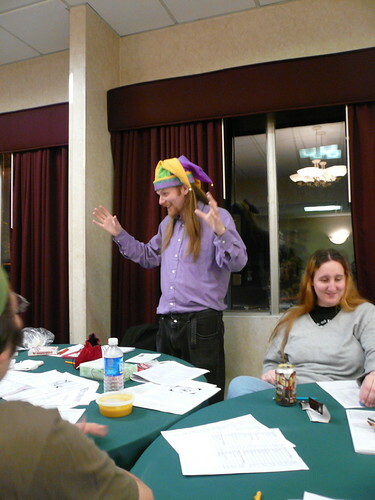 There was the Official Sluggy Freelance RPG, which went well, and a good time was had by all. Pete played, and summoned an angel for a cheeseburger. Even the guy who wore a bulletproof mech suit and still got slaughtered by two ferrets had a good time. (The ferrets, incidentally, were played by Harukaze and our friend Emily, who I don't think is on the board.) So did Brendan (a true unsung Sluggite hero, who runs the web servers), who played a Christmas elf that got crushed into near-oblivion by the mech suit when it fell; Pete renamed his character Squishyflatflat. I got to wear a badge bearing the cognomen, "Slutty RPG Guy," courtesy of Kristy. (Is that the same Kristy who started this thread? Or a different Sluggite named Kristy who was at UberCon? Unless she happens to read this thread again... The world may never know.) She kept apologizing, but personally, I thought it was a damn fitting description. Also, there was more gaming. Maybe someone who went for something besides gaming should contribute something to this. We found out Sunday that the settings on my camera were all wonky, so some of the pics are slightly blurry from Sat. night. Ooh... And now I know who Brendan is on the forums. For those of you who don't know, he's the guy who's not in any of the RPG pictures. There's one of him buried somewhere in there if you scroll back far enough. You oughtta represent yourself a little better, Brendan. The Con rocked up and down, side to side (unlike the comic, which only rocks side to side, Pete's working on the up and down part). Teaser: there may even be some SBG action coming soon. He claims he doesn't really exist. So if you guys saw him there you must have been imagining it. Hey, I'm cool with imaginary friends. When I was eight, Puff the Magic Dragon was my man. Until Disney's evil lawyers came and told you that you needed to pay licensing fees to use their Intellectual Property in your imagination? Was this mech armor related to the discussions we've been having about tweeking the rules for forms of niftier heavy armor, Brent? Just curious. I do have to say with the massive mech destruction via ferrets and the whole thing with the Black Ops elf (It's a Slurf in disguise, kill it! ), that was the most amusing RPG I've ever witnessed! Yup, the ferret was Silver. And for anyone who was curious, Emily is the chick sitting beside me in that photograph-thingy up there, and Silver is significant just because she's been in a bunch of other playtest games. Harukaze, however, was playing a completely unrelated ferret. That's probably why he isn't pictured. Only people who play well-established ferrets get to be in Con pictures. And, no, the mech armor wasn't anything related to what we'd been discussing. He just wanted a mech suit, so I made up some not-too-complicated rules off the top of my head and went with it. Pretty cool, though. When he attacked the Mayor of the town for no good reason, it took about seven other players about four rounds to take him out... Not because he was at all overpowered, but just because none of the people with shotguns and laser pistols and all manner of implements of destruction seemed to be able to hit the broad side of a Super K-mart that day... However, the ferrets, one with a knife and one with claws and teeth, kept rolling combat gold... And while Harukaze's ferret technically delivered the coup-de-gras, the real final blow was delivered not by an implent of destruction OR a ferret, but by rit's elf, who attached a laptop to the mech, hacked into its control software, and shut it down. Unfortunately, the mech was flying about forty feet above the ground at that point, and the elf was hanging from its torso by a USB-cable... And, yeah. Squishyflatflat. Despite all of it, the newly-Christened and half-dead elf managed to wriggle out from under the now-deceased mech, only to be greeted by Pete's character, the Wizard Weasel, yelling "It's a Slurf in disguise! Shoot it!" And, of course, someone listened. So, after much effort on Ronald's part, the extra damage from the cleats was healed (but no more), and Squishyflatflat ended the game comatose but alive. Also, the Wizard Weasel successfully haggled Ronald into giving him a cheeseburger before he departed.